Sanfoundry located at Bangalore offers internships to deserving B.Tech/M.Tech Students in System & Control Engineering Branch. 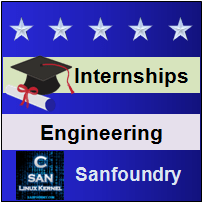 In System & Control Engineering internships offered by Sanfoundry, shortlisted interns will be working towards the creation of useful artifacts like questions and answers, tutorials, articles, real-world problems and solutions on System & Control Engineering. Moreover, every intern working on System & Control Engineering internship will focus on one specific subject under the System & Control branch. This will help the intern to develop an in-depth understanding of that particular subject in their branch. Sanfoundry is looking for Interns who are passionate about their field of study and like core subjects in System & Control Engineering. Every intern contributes to Sanfoundry’s Global learning project during their internship and is Mentored and Guided by our Founder and CTO. If you are interested to contribute and apply, here’s full detail of Sanfoundry’s Internship Program. Sanfoundry Global Education & Learning Series – System and Control Engineering Internships!